What I don't understand, though, is how some sales ladies here in Philippines tend to focus on just their SALES, rather than showing genuine interest in helping a potential customer. I've encountered one too many assistants from different high end brands (won't name them here) located at Glorietta or Shangrila which have given me the cold shoulder when I said I wasn't ready to buy yet, or when I asked for samples, or when I explained that I was testing the product and was planning to order it from the US (because it's cheaper there). I find that kind of treatment really unfair. Buying makeup is not as easy as buying clothes on a rack. It takes time and a lot of ladies want to know what they're getting into before they shell out 2000++ on an expensive brand. Hi Jin! 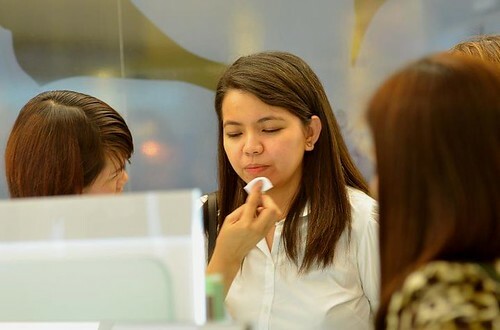 I agree that beauty counter assistants should be trained well when it comes to customer service - after all, experiencing a brand goes way beyond than just products. It's how their representatives treat you that can make or break the deal. However, sometimes, even if these sales people know what to do (or not to do) when dealing with customers, they get frustrated too. I do know that they're under tremendous pressure to make the monthly quota. For example, their employer can tell them "You need to bring in P200,000 this month" but they only get a tiny percentage of that on top of a basic salary of P8,000 to P10,000. They stand for 10-12 hours for five days every week. No wonder some of them are cranky! I'm not excusing their (sometimes) bad behavior but this is the reason I try to be kinder when interacting with them. It's a difficult job and I don't want to make it more difficult if I don't have to. About samples, they're not so popular in the Philippines because brands are afraid of being copied by their competitors. Same reason why you can't take pictures without permission - they don't want "spies" to document how they set up their merchandise. A lot of work goes into that - I know this from personal experience - and believe it or not, spying is a very real thing among retailers here in the country. If a sales person can prevent that from happening on their watch, they will. Filipinos are also quite enterprising. Where in the US people won't bother re-selling samples simply because no one would buy them, here samples have a good resale value especially if they're from expensive names. So that's one reason that high-end brands don't usually provide samples without purchase, your purchase being proof that you're a real customer, not a racketeer out to make a quick buck. I'm not saying that it's right to treat customers as if they're there to do something wrong. I'm just trying to explain what kind of challenges sales people face everyday. Now, here's how to work with beauty counter assistants! These tips are simple, neat, and won't embarrass anyone. 1. Be clear about your intentions from the get-go. When the sales assistant approaches you and asks, "Hi, how can I help you?" tell her/him exactly what you want. "I'm looking for my foundation shade", "What's a nice lipstick color for me?". Or if you're just looking around, say, with matching eye contact and a warm smile, that you're just looking around. If you don't want them to hover, say you'll call them if you need anything. Remember, you don't have to endure over-solicitous SAs nor do they have to guess what you're thinking. Communicate and chill out. 2. If you feel hostility or resentfulness from the SA, just ignore it. Sometimes it's all in your head; some SAs just look naturally mataray. Sometimes they really are a nasty piece of work, in which case, just remember that their behavior says more about them than it does about you. Don't take it personally! You don't look like a poor and uncouth person who can't afford anything in the store. The SA may just have an attitude problem. Or her dog just died. 3. Don't get guilt tripped into buying something you don't want. Yes, even if the SA was gracious enough to help you with everything. It's not a favor, that's why she's there anyway! Walk away if you think the product isn't a good fit for you. Be polite and tell the SA why you're not getting it, then thank her for her help. Remember, you have to be kind to SAs, but you don't have to give them any charity. 4. Whether you buy something or not, say goodbye properly. Make eye contact, smile, and say thank you. Or at least give a nod if they're busy entertaining someone else. And that's it really. :) How about you guys, do you have any tips on dealing with snooty SAs?